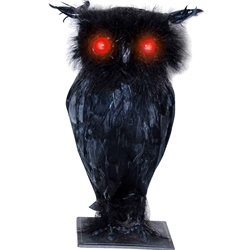 Decorate your house for Halloween or as part of your décor for your next haunted house with the black feather owl with light-up eyes and sound. The black owl with lights and sound Halloween decoration is colored as pictured. Decoration measures 10.5” tall. Requires 3 “AG13” batteries (not included).